Smoke coming out of a Crosby chemical facility where a fire broke out Tuesday. One worker is dead and two others injured after a fire broke out at a Crosby, Texas chemical facility Tuesday. The Harris County Fire Marshal’s Office (HCFMO) said the fire at the KMCO chemical facility has been extinguished. HCFMO investigators are on scene conducting interviews and investigating the exact point of origin and what caused the fire. Crosby is about 25 miles northeast of Houston. As a result of the incident, there was a shelter in place order for a one-mile radius around the facility. However, it has now been lifted. Harris County Sheriff Ed Gonzalez confirmed during a news conference that one person died at the scene. Two other people were severely injured and have been taken by Life Flight helicopters to area hospitals. They are in critical condition, according to the Harris County Fire Marshal’s Office (HCFMO). The Crosby Fire Department is leading the response to the incident, along with the offices of the fire marshal and sheriff. 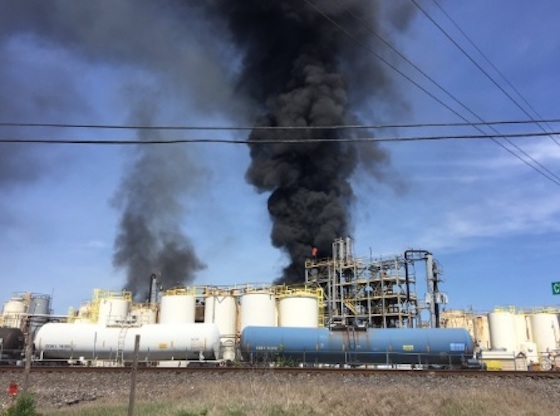 Gonzalez and HCFMO Spokeswoman Rachel Moreno said the fire seems to have started when a transfer line ignited close to a tank containing isobutylene, a flammable colorless gas used in the production of high octane gasoline. An adjacent storage building with solid combustible goods also caught fire, according to the sheriff. Moreno said the Fire Marshal’s Office was notified about the incident around 11 a.m. and sent HazMat crews and inspectors to the scene. The agency is investigating what chemicals are in the facility. Company officials are cooperating with the investigation and are working to provide details of the types of chemicals stored at the site. Gonzalez said the U.S. Environmental Protection Agency has been on the ground and in the air, and there had been no actionable air pollution detections by the time of this update. Harris County pollution experts are also monitoring air quality. Additionally, the Texas Commission on Environmental Quality has dispatched emergency response personnel to conduct an initial assessment of the fire. Harris County Judge Lina Hidalgo said in a statement that the county’s public health department is also monitoring the situation. She added there are no indications of an immediate health risk to the areas surrounding the facility. KMCO President and Chief Executive John Foley said the company has activated its emergency response team and incident command center. Foley added his company’s response team is working with local first responders to extinguish the fire. He also extended his sympathies to the victims and their families.